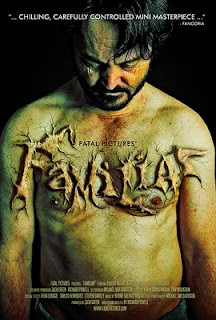 Fatal Pictures Unveil New FAMILIAR Poster. Fatal Pictures, the independent company behind that film (and the short Consumption) has given a few select horror sites a first glimpse at the poster for their next offering Familiar. The film is written/directed by co-founder Richard Powell, the creative mind behind all three Fatal Pictures shorts. The film is produced by Zach Green, and lensed by Cinematographer Michael Jari Davidson, who also served as Co Producer.